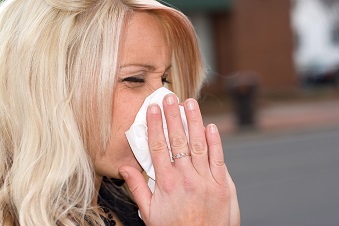 If you are one of those annual suffers of allergies, let Dr. Miller start your resistance building program now. How often have you heard, I’d love to be outside, but I can’t stand the outside air because of the ragweed, dry grass or pollen. If so, you know how miserable a person can be who has “allergies”. An allergy is a hypersensitivity to a substance which is harmless in similar amounts for the average person. Since allergies show up in so many different forms, there must be a common denominator or cause somewhere in the body. Because the control of all body activity starts in the nerve cells of the brain, which is the master controlling system of the body, here is where we find the answer. The brain is the body’s power plant that produces vital nerve energy to keep the organs of the body healthy and to fight off foreign substances entering the cells and tissues that influence allergies. This vital nerve energy is transmitted through the spinal cord and spinal nerves, which exit through holes between the 24 movable vertebrae. If the bones of the spine become misaligned, pressure is put on the delicate nerve trunks and the flow of nerve energy is impinged. Without this flow of nerve energy, resistance in some part of the body is lowered to the extent that some foreign substance may present an allergic effect on some part of the body. If you are one of those annual suffers of allergies, let Dr. Miller start your resistance building program now, so that when your usual time for allergic discomfort arrives, the discomfort, if not entirely abolished, will be lessen to an appreciable degree and you can start enjoying many outdoor activities. Discover what Waterford’s “Top” Chiropractor can do for you!